Kids play rugs features 8 popular designs. 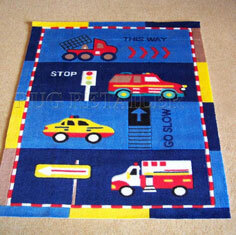 These rugs will look great in any child's bedroom and some even have educational themes such as ABC and 123. Kids play rugs are made using easy clean acrylic. Kids play rugs are made in China and are made free from illegal child labour.